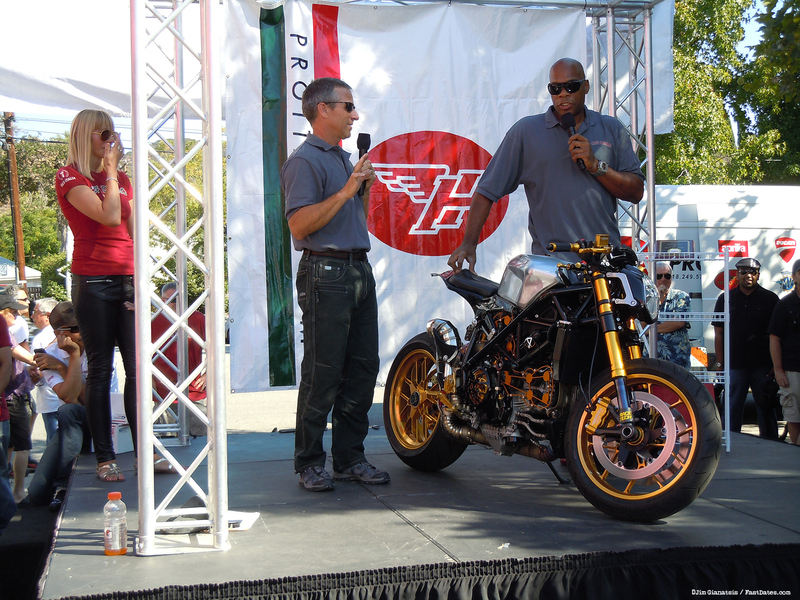 Nick Inestach (left) on the cafe Desmo stagewith comedian Alonzo Bodden (right) and his Best of Show winning Ducati 1098 Superbike custom built by Nick Anglada Originals and featured on the TV show Cafe racer. 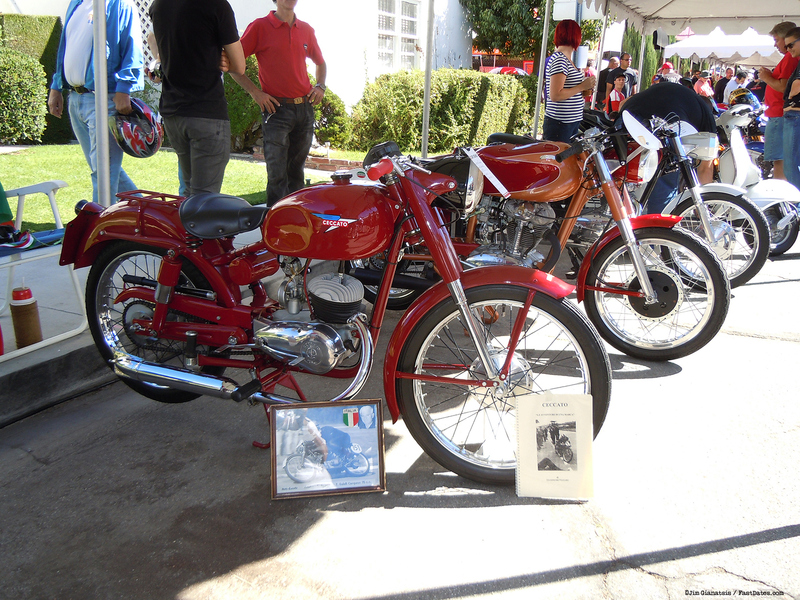 Montrose, CA, October 2011 - Pro Italia Motorcycles, located in the beautiful little village of Montrose in the foothills to the San Gabriel Mountains above Glendale/Los Angeles, California is one of the premier Italian motorcycle dealers on the West Coast. 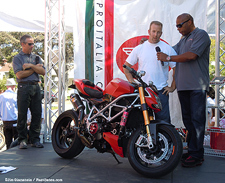 Their motorcycle lines include Ducati, MV Agusta, and Aprilia, and just recently the new Buell Sportbikes. 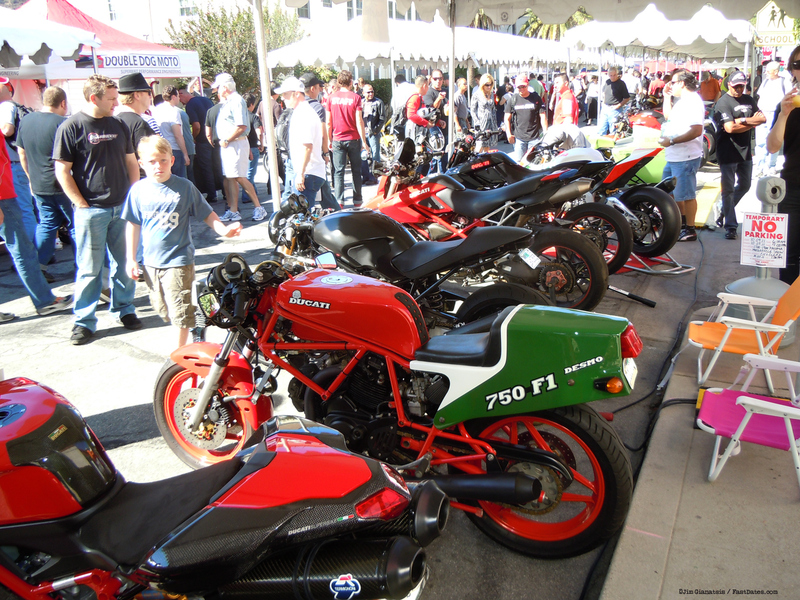 Each year in October as the summer and the World Championship racing schedule cools down, they hold their annual Cafe Desmo motorcycle show on the closed off street alongside their dealership. 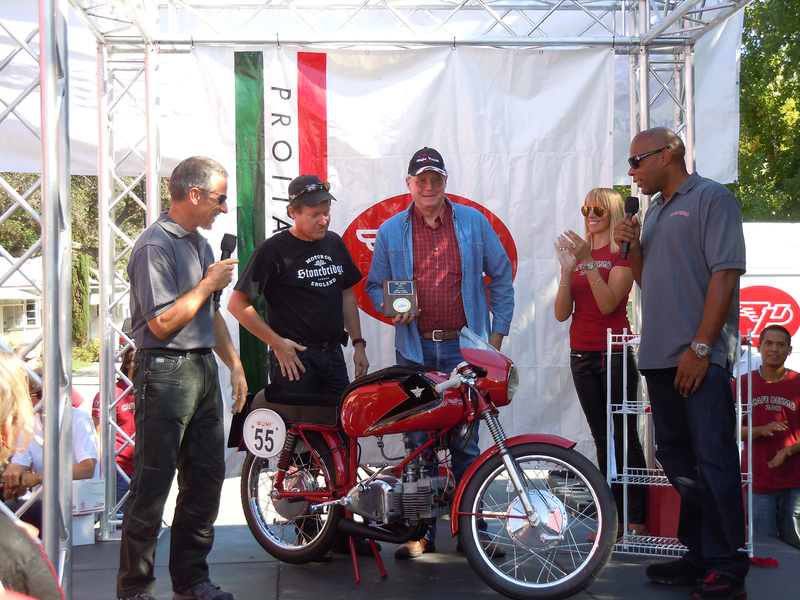 This year Pro Italia's managing partner/owner Bill Nation went all out to make Cafe Desmo the best year with an incredible turnout of beautiful custom, stock and collector Italian, Japanese and British bikes, and related vendors. Helping to add to the excitement of the day, Bill brought in Eric Buell with one of his new 1190 RS racebike to meet with enthusiasts. 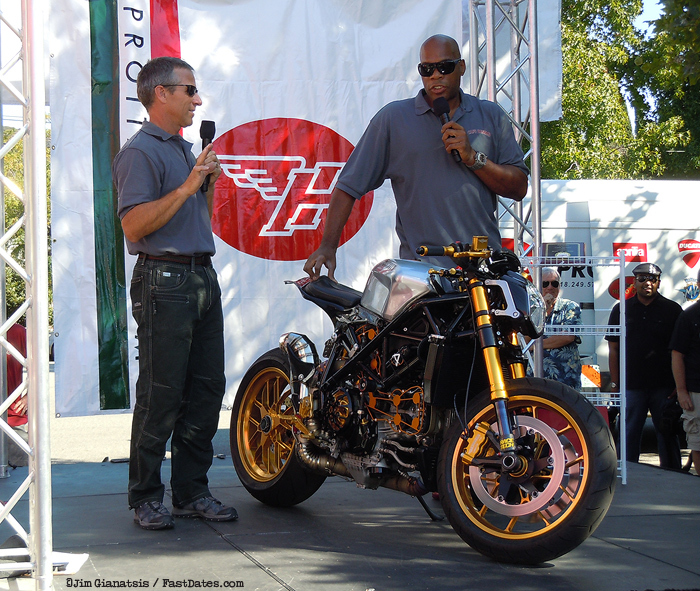 And the day's interviews, announcements and stage awards activities were hosted by Yamaha Racing School lead instructor Nick Inestach, and Cafe Racer TV's featured celebrity, comedian Alonzo Bodden, with his custom Ducati 1098 Superbike - "The only motorcycle that Jay Leno doesn't own." 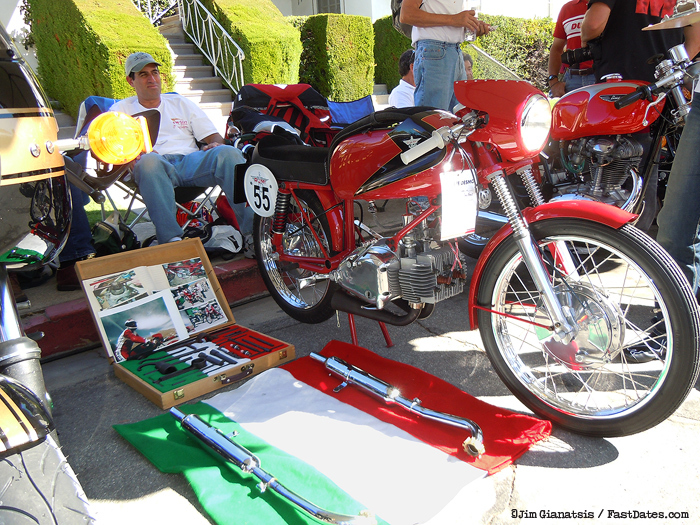 Enjoy our picture coverage of Pro Italia's 2011 Cafe Desmo Show, and check the ProItalia.com website for news of future Cafe Desmos held each year in October. 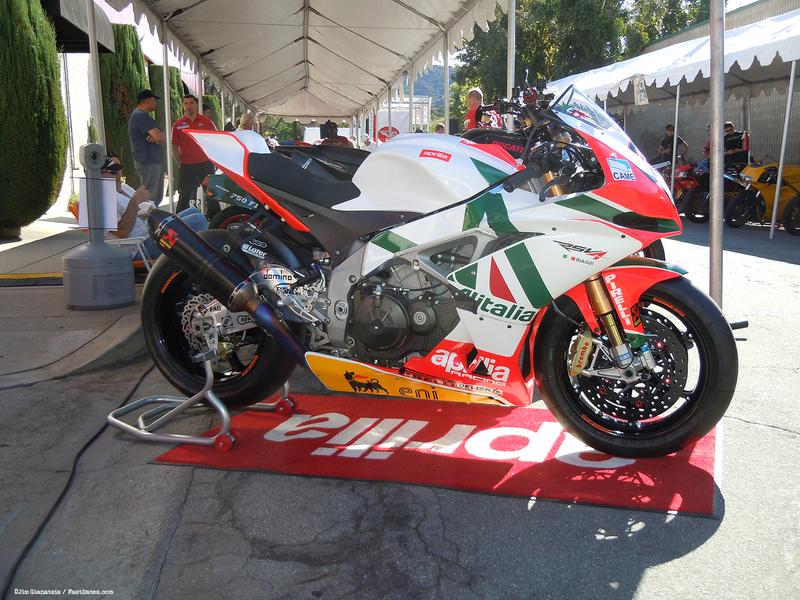 Want to go World Superbike racing? 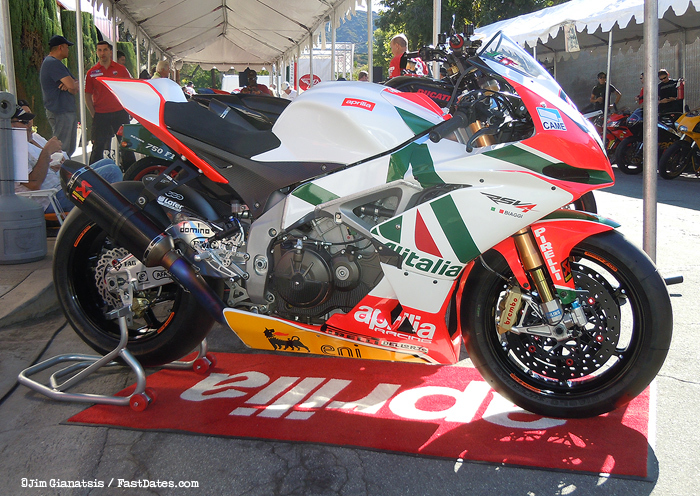 Above, the Aprilia RSV4 Max Biaggi edition customer race bike retails for about $70,000. 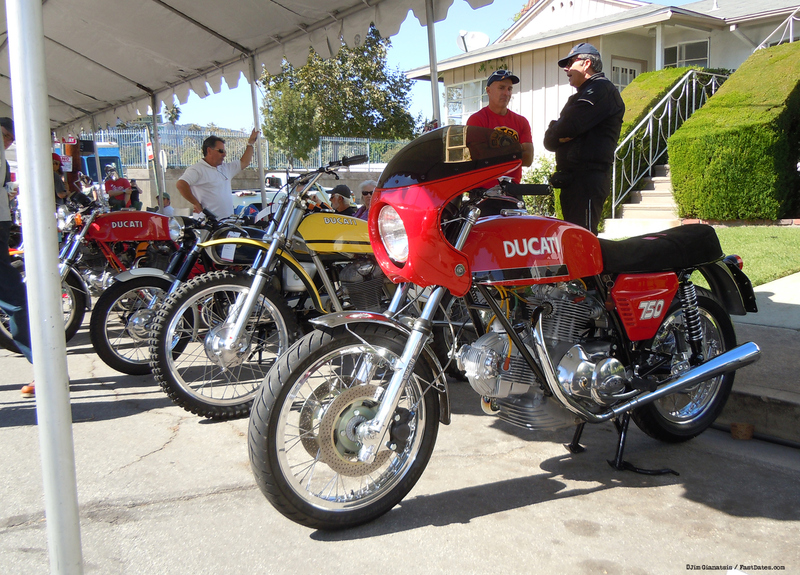 Ducs in a row, including a 1985 750cc F1 machine. 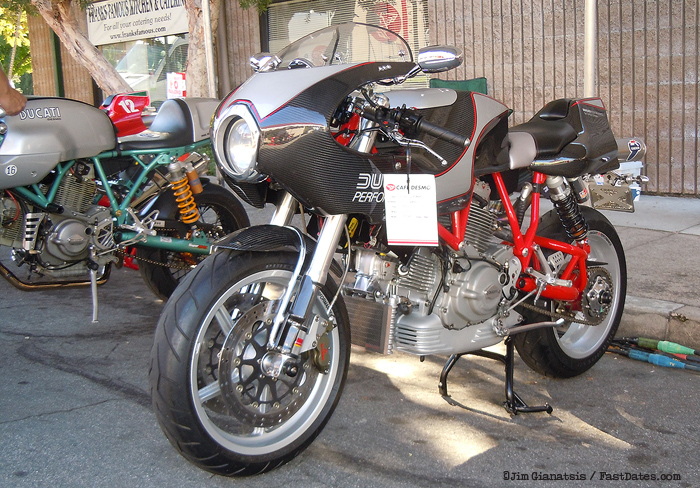 The exotic French Veyrus powered by a Ducati Testastretta engine. 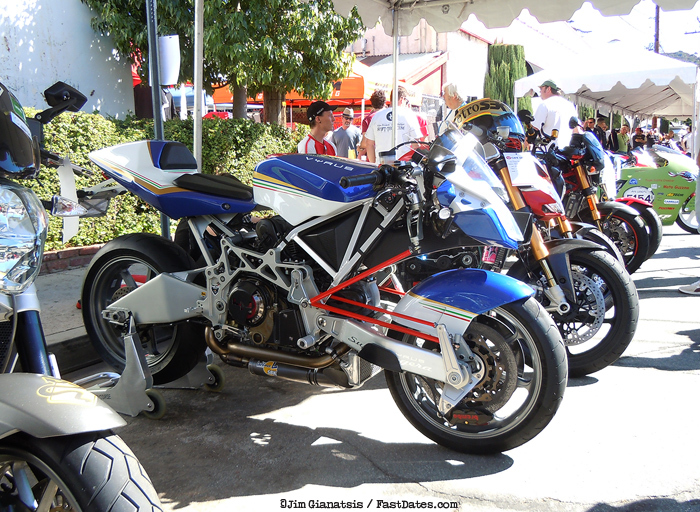 Legendary FastDates.com Calendar often featured bike builder and LA Calendar Motorcycle Best of Show winner Shinya Kimura was at Cafe Desmo with his latest personal bike, a retro custom MV Agusta 750 built up from a complete basket case. 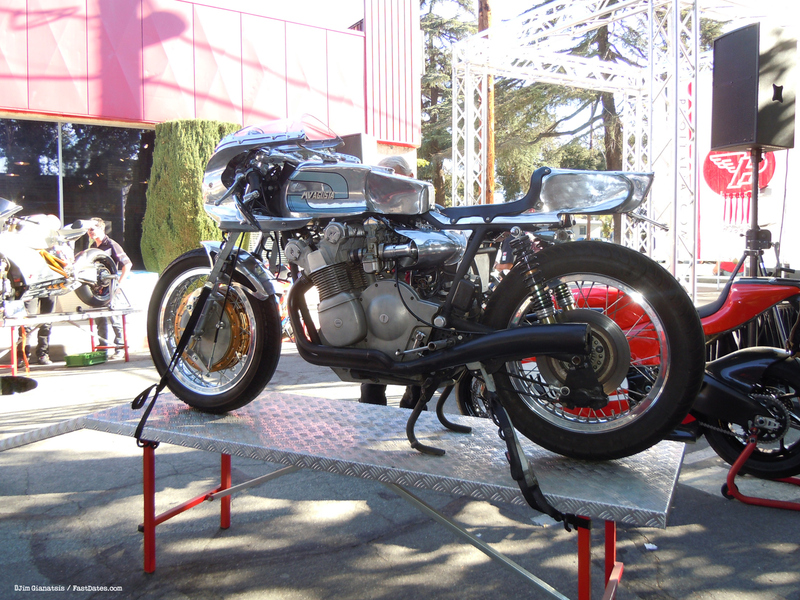 Here Nick Inestach interviews Shinya about his bike. 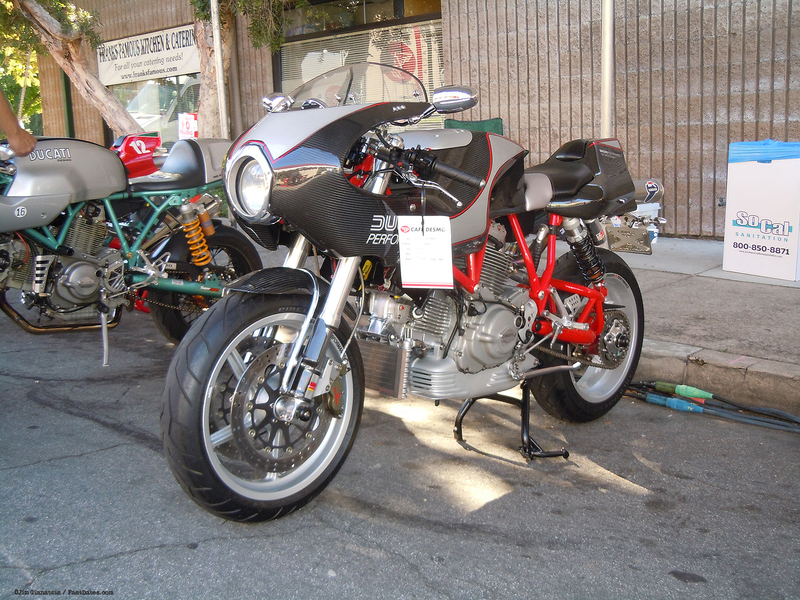 A beautiful Mike Hailwood Ducati Desmo with full carbon fibre bodywork and Termignoni exhaust System. Above, 1970's era Ducati 100/125/1175/200 singles. 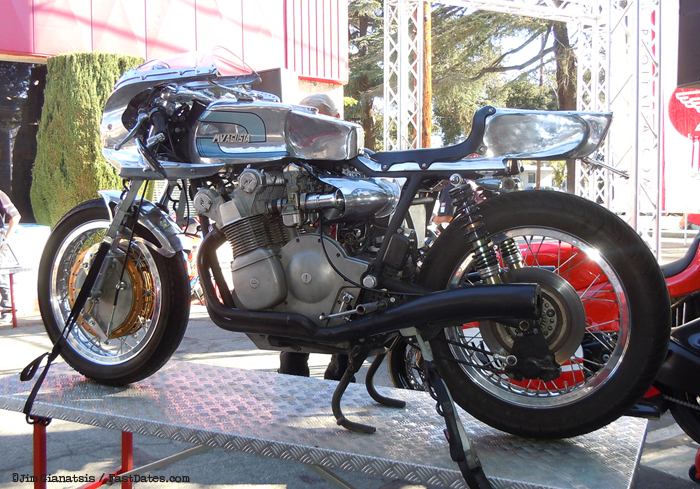 Below: a rare Ceccato 2-stoke. 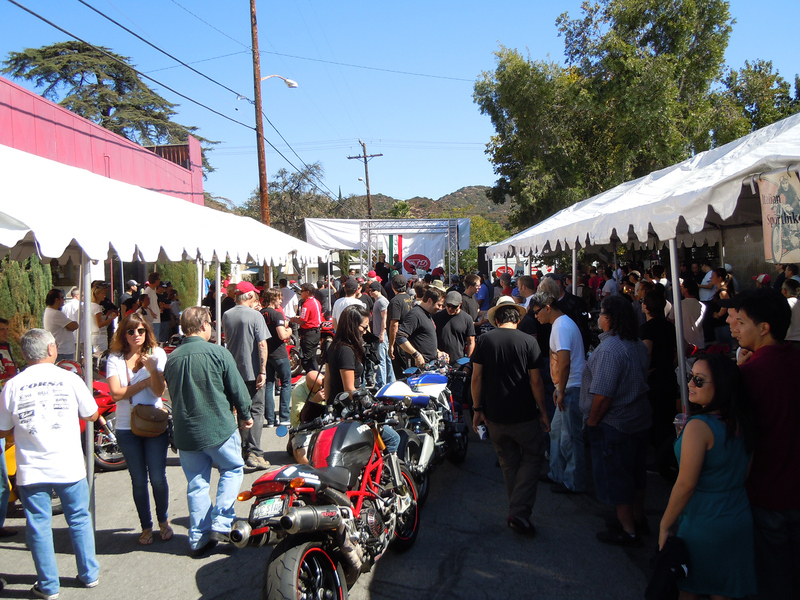 A sea of enthusiasts, venders and display motorcycles crowd the side street next to Pro Italia for their annual Cafe Desmo bike show. 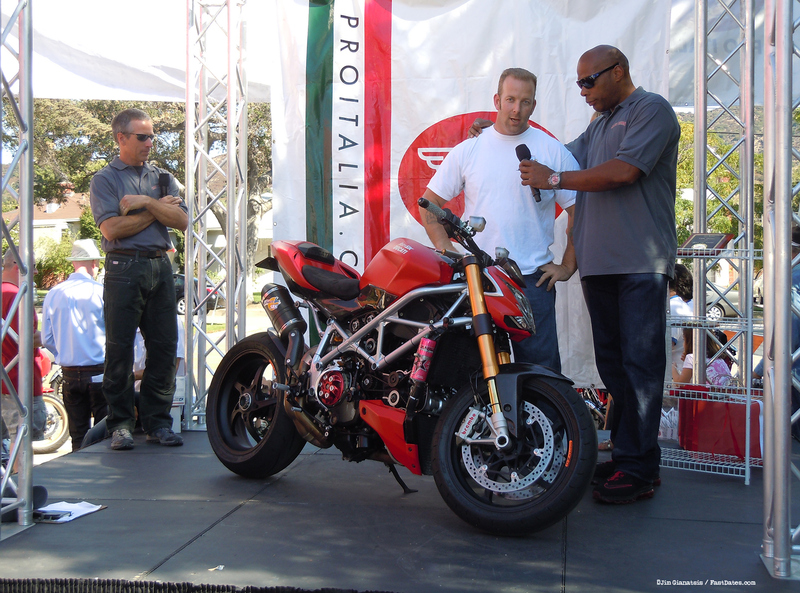 Celebrity bike contest Eric Buell gets cornered by fans. 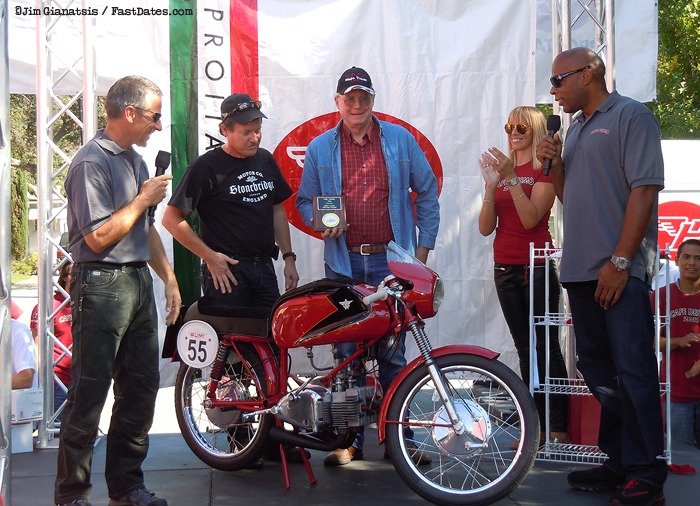 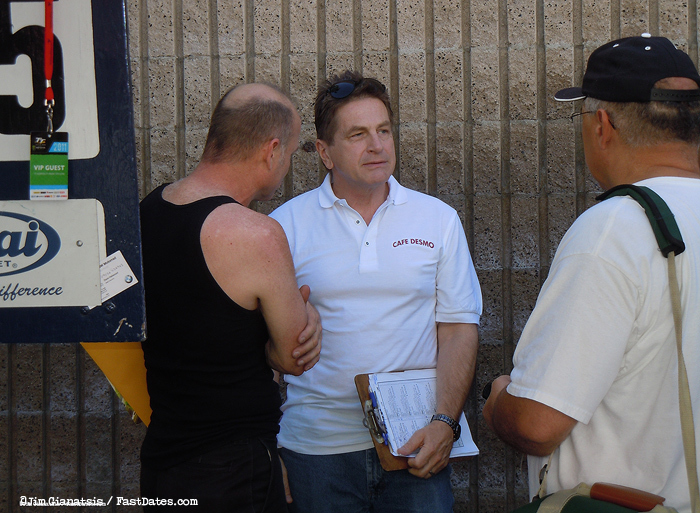 Brain Catterson, editor of Motorcyclist magazine, was another guest judge. 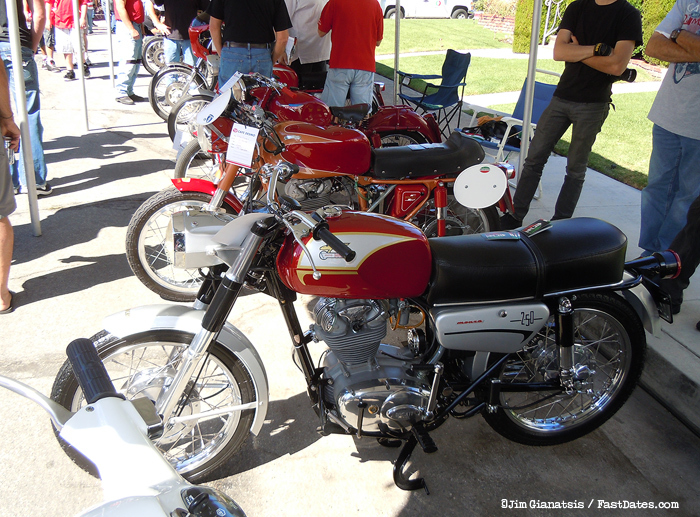 A 1972 Ducati 750 GT up front, and behind it the rare off road RT 450 Scrambler from 1971. 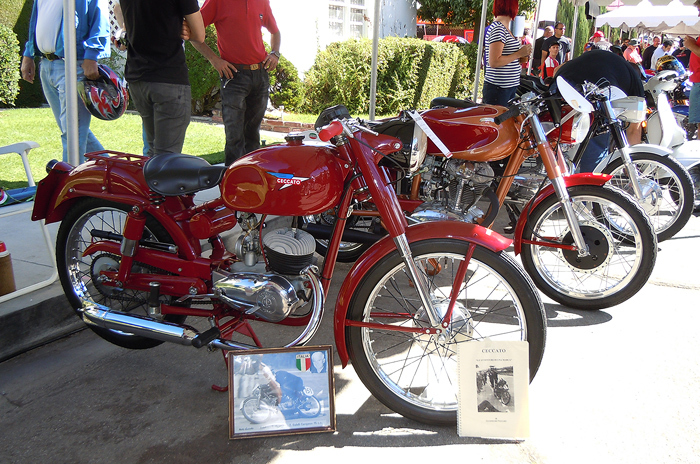 Above: An early 1960's MV Agusta wins its class. 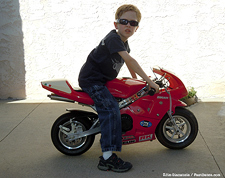 More cool rides for Big Guys, Little Guys and Old Guys.